This CellML model runs in OpenCell and COR but does not recreate the published results (figure 3). The units have been checked and they are consistent. The equations appear to match those in the paper (7a-7e) and the parameter values have been taken from section 7 of the paper (page 2075). The CellML model simulation output fails to oscillate. 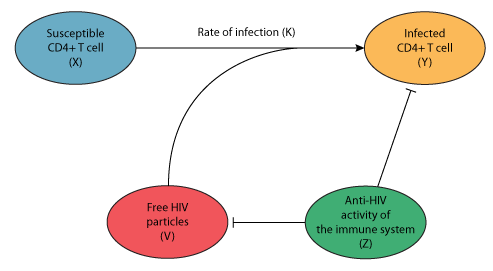 ABSTRACT: The idea is put forward and analysed numerically, that within an infected person HIV evolves to increase its reproductivity within the population of CD4+ cells. A mathematical model predicts initial viremia and CD4+ cell drop after HIV infection and thereafter a slow progressive decline in the number of CD4+ cells, although for an extended period HIV is kept at a relatively low level by an active immune response. The time span T until the number of CD4+ cells falls below 20 per cent of its normal value depends on several model parameters. Assuming Gaussian distributions for these parameters, the model predicts a distribution function for T which resembles the observed distribution function for the incubation period to AIDS. Derived from workspace Schenzle 1994 at changeset f4acd197187f.